Tim Starkey and I have been exploring the connection between student growth (SGP specifically), grit, and growth mindset (see this post for an overview). Beginning this process, Starkey had students read an article about brain growth from Mindset Works. I couldn’t post this resource, so instead here are a couple of links to articles and resources about brain “growth” (or neuroplasticity). In addition, the three minute video in this post is an excellent introduction to the science of brain growth and change. “Nurture the Miracle of Neuroplasticity” from The Huffington Post; This article describes the experience of Dr. Jill Bolte as she recovers from a stroke and how her life provides an illustration for the brain’s ability to change. Do you think STAR is an accurate measure of your capabilities and growth in reading? How do you believe that you could improve your growth and achievement in reading? Vocabulary: Students said it was unfair to be tested on unfamiliar vocabulary, so we spent some time talking about use of context clues and additional strategies to identify the meaning of words. In addition, we discussed defining unfamiliar words as a “skill” while reading complex texts. Level of Challenge: Some students felt the second test was “harder.” To address this concern, we explained to students how the STAR test will “learn” to meet them at the level to which they are prepared. This means that the test will get harder for them as it understands where they should be. Effort: Part of the class stated they had not given the test their complete effort. To address this, we asked them if they felt as though their effort would change for the next test based upon this reflection. This last point resulted in a conversation with students about their capabilities. Many students felt as though they could do better than the test had indicated. At the end of the conversation, 3/4 of students raised their hands when asked if they believed they could improve their score for the next test. When asked how they thought they could go about the process of trying to improve skills, one of the major points of discussion was how time spent reading impacted students ability to comprehend overall. In addition, we also discussed how ATOS levels could be used to choose texts that would appropriately meet their needs, all the while stressing the importance of challenging themselves with material that would help build the skills needed to grapple with complex texts. This conversation paired with a text about students’ ability to grow seemed to be an effective means of student reflection. We continued this process though a discussion of growth and grit which I will outline in additional posts. In Lunsford’s class at Stanford students do write a term paper at the beginning of the quarter, but then they transform the information into into a Power Point, website, blog etc. throughout the rest of the class. Because of the capabilities implicit in blogging, Sarah Harris wanted to work together on a lesson where students would explore the differences between blogging and writing an essay and then take advantage of the unique capabilities of blogging through writing and publishing their own post. I understand how writing for a blog is different from writing an essay. I can plan writing, research, and multimedia elements to use in a blog post that meets my own intended purposes as a writer. What is a “blog”? Describe what writing or reading you have done using the blog format. How is traditional “blogging” different from writing as essay? What can a blog do that an essay cannot? Research: Writing an essay may include text evidence from one or multiple sources, but research is implicit in the blogging process as well. It is standard practice to link to articles and content relating to one’s topic that might be of interest. In addition, it is assumed that any research or content that inspired the post will be linked to authors and sources and cited appropriately. Audience: The audience for a blog might be a teacher or fellow students, but it can also include those interested in one’s topic more generally. Also, the audience is much larger and more continuous with blog posts versus essays because content is on the internet, available to everyone, and can be viewed at any point after it is written. 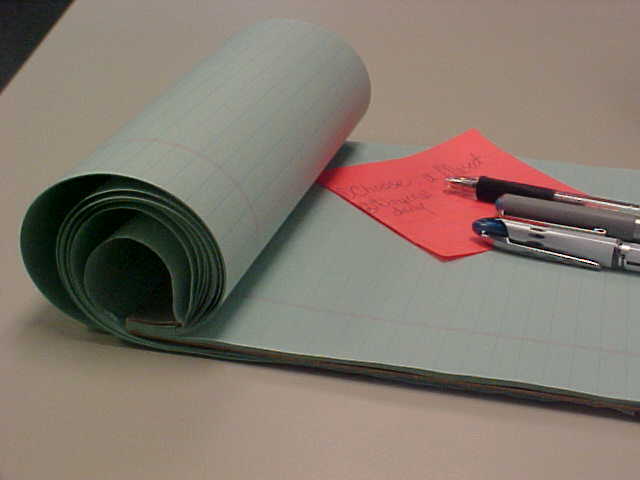 Continuous Conversation: While a student’s experience with the content in an essay ends when the paper is turned in, when a blog post is published, it may be only the beginning. Through comments and a dialogue with others about the topic, the learning of the student may continue online. This provides the opportunity for academic and personal dialogue and additional writing. Use of Multimedia: When writing for a paper, there is little to no opportunity for use of multimedia to enrich content. This is a area of exploration for students when blogging because the medium allows for use of personal photos, Power Point slides, Word documents, videos, and other images. As part of the dialogue, we encouraged students to consider their blog post as a “point in the larger conversation” about their topic. The process begins with research on what others have to say, followed by the student establishing his or her own point of view in the conversation, and continuing with a dialogue with peers online related to their topic. Students were then given one of my own blog posts to analyze using these elements as presented in a graphic organizer. I encouraged them to look at it online if possible so that they could explore the links and videos. Afterward, we discussed what they found. Due to time, we did not introduce the blog post brainstorming sheet or the rubric for their own post; however, these resources will be used as students prepare to write their own blog post for their senior project website. We ended the lesson by reviewing a blogging process that students can use as a model. I talked about my own post (about vulnerability) as an example. Students will continue this process throughout the year. They will create a blog post for the four parts of their senior project (research, service, product and presentation component). Analysis of a Blog Post Graphic Organizer: This organizer can be used to analyze any blog post focusing on key elements such as purpose, audience, research etc. Kristina Claytor wanted her students to read non-fiction texts in preparation for a Socratic Seminar over themes in Divergent; She also wanted them to practice annotation strategies. To this end, we planned a lesson where the teacher modeled metacognitive annotation and then students practiced the skill independently and in small groups. Primary Question: What is identity? In other words, what makes you who you are? · What external factors (things outside of yourself and your control) make you who you are? · What internal factors make you who you are? · Is identity able to be changed or is it unchangeable? · What struggles do teens face when trying to establish who they are? · How can teens overcome these struggles? How? identity compared to someone in Divergent? · Do other people’s perceptions define you, or do you define yourself? I can interact and “converse” with a text through the process of annotation. I can note important elements of a text, which I may have to reference later in class discussion or in my writing. What do you do while you are reading? What is your reading process? How do you know what is important? What do you do when you struggle to understand something? What is going on in your brain while you are reading? After students wrote about the topic, we had a class discussion about responses. Many students admitted to struggling with comprehension. However, some were also able to identify coping mechanisms, such as using context clues, pausing after paragraphs to think, and looking at text in bold or italics again. We also discussed how reading non-fiction texts differs from fiction; there isn’t a “narrative” to grab the reader with informational texts. We analyzed the purposes of each text type (to entertain versus to inform) and how each changes the reading process. Annotation of non-fiction texts was introduced as a way to “converse” with the ideas presented since “visualization” (as in with a story or narrative) wouldn’t be as easy. Annotation can therefore assist with comprehension and engagement with texts that provide unique challenges. After the quick write, we went over a handout providing metacognitive annotation symbols (see bottom of the post for the handout). We also gave them a Sample Text to Annotate and modeled annotation with them using the symbols provided. To do this, we opened the file in Word on the LCD projector, highlighted text, and then used the “insert comment” function to put in our annotations. Students were most interested in the “text-to-self” connections made in the process. They seemed to enjoy my personal connections. (We were using the New Yorker article about the trauma caused by high school.) I had some to say on this topic. We found the practice activity worked best when we gave students a certain number of connections, questions, comments etc. to make on their article independently. Then, they met in their tiered groups to compare notes afterward. After reading the extremely informative article “True Grit: The Best Indicator of Student Success” on the Edutopia website, I became interested in the study of grit and its correlation to student growth. There are many helpful resources in the post including diagnostic tools for measuring grit (using the grit scale) and growth versus fixed mindset (using an online quiz). Growth versus fixed mindset, or one’s belief that growth of talent and intelligence is either fixed or capable of growing, can be a contributing factor to students’ desire to persevere despite obstacles. According to the research of Carol Dweck, this intrinsic factor (and the external forces, such as feedback, that may affect it) could contribute to the achievement and growth of students. “The Talent Myth”– From The New Yorker, the article summarizes the “myths” that incapacitate businesses when it comes to recruiting the “right” people for jobs based upon talent alone. “How Not to Talk to your Kids: The Inverse Power of Praise”– From New York, this article explains that feedback which emphasizes “intelligence” and “talent” (for example, “you are such a good writer” or “you are so smart”) can actually hinder students desire and ability to accomplish difficult tasks. “Why do Some People Learn Faster”– From Wired, this article summarizes the research on growth mindset conducted by Carol Dweck and others. It states that learning from mistakes is a prime component of one’s ability to grow, stating, “Education is the wisdom wrung from failure.” Note: This source is written by Jonah Lehrer, who is a journalist of disrepute. However, the research in the article can be cross-referenced in other sources and is useful. Mindset Works– Based on the research of Carol Dweck, this website provides resources for teachers interested in implementing growth mindset education and practices in the classroom. You have to register for an account, but from the website, articles, resources and a TedTalk about growth mindset can be accessed. I have begun working with Tim Starkey using this process, and I will be posting the resources and follow-up information from our work together soon. My hope is to expand the scope of my collaboration and work with all willing teachers in the two high schools. John Green, author of The Fault in Our Stars and Looking for Alaska, publishes a series of funny “crash courses” on Youtube that discuss/analyze pieces of literature including Catcher in the Rye, Romeo and Juliet, and The Great Gatsby. Carrie Eniex showed Love or Lust: Romeo and Juliet Part II as an attention grabber before introducing the Socratic Seminar over Romeo and Juliet using the resources gathered in this post (called Romeo and Juliet Socratic Seminar Part I: Teens and Decision Making). The topic of the video relates to the aspect of the Socratic Seminar students seem to connect to most: teenage love and relationships. It was interesting (and highly entertaining) in Dave Watros’ classes to hear teenage boys and girls discuss the topic of romantic interests. Repeatedly, the question “What is love?” was raised (and avoided) but in the middle of the second day, the discussion finally gained footing, and by the end of the conversation, teenage boys were giving their definition of love in earnest.